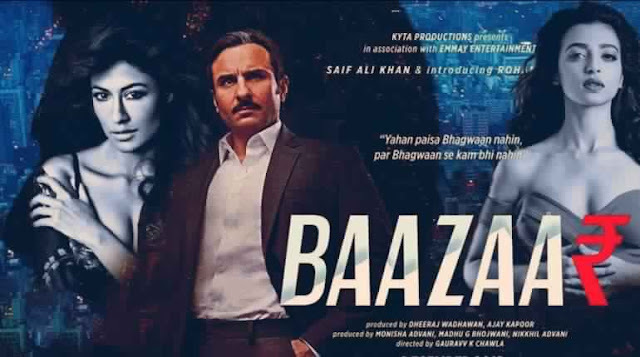 Baazaar Movie Review Saif Ali Khan And Radhika Apte Excellent Performance: Baazaar film is based on the share market story which is lead by Saif Ali Khan. The stock market volatility and the things around the world have been a show in the film, let us know how this film is created. The story begins with the Mumbai industrialist Shakun Kothari (Saif Ali Khan), who considers himself a king of the stock market. Shakun wife is Mandira Kothari (Chitrangada Singh). The merchant with Shakun burns him because he is the most different way of doing his work. Meanwhile, Rizwan Ahmed (Rohan Mehra) who is trading in Allahabad city come in Mumbai. He has only one dream, meet Shakun Kothari once. Meanwhile, Rizwan meets Priya (Radhika Apte), who works in a trading company. The incident of various incidents before and after meeting Rizwan's Shakun and before a meeting is also an interesting plot. In the end, the story reaches a different point, which you will have to watch the movie to know. The story of the film is very interesting and especially its screenplay is amazing. It does not seem to know when the interval comes when watching the movie. The film's dialogue is also very interesting the way the story goes, the story is very interesting. Research in the stock market is also very appreciable. For anyone who does not know about the stock market, it becomes easier for the film to see. There is a different kind of representation of the film. That is also quite stylish and you will be able to make a difference by going to the theater. After a long time, Saif Ali Khan has given a performance similar to Omkara done very excellent acting. Along with this, Rohan Mehra, son of the famous actor Vinod Mehra, is also stepping into the Hindi film industry with this film. But seeing him don't look absolute that this is his first film. Radhika Apte has once again told us why she is called the best actor. Radhika as Priya is seen in the movie and other characters of the film have also acted smoothly. According to film expert, the budget of the film is about 40 crores and it will be released in more than 1500 screens. Saif Ali Khan's fans will definitely see and like this movie and will get a good opening.